Chief of Staff Tanner attempts to get Bond to understand the danger by citing the Kefauver Report and the fact that 34 murders were being committed in America every day. Bond’s face relaxed. ‘Come on, Bill,’ he said. ‘If that’s all there is to it, I’ll buy you lunch. It’s my turn and I feel like celebrating. No more paperwork this summer. I’ll take you to Scotts’ and we’ll have some of their dressed crab and a pint of black velvet. You’ve taken a load off my mind. I thought there might be some ghastly snag about this job. Scotts’ was a favorite restaurant of Bond’s (and Fleming’s) located at that time at 18-20 Coventry Street, Westminster. While there was (and is) a Canadian whisky by the name of Black Velvet, it would appear here that Fleming is referring to a cocktail by the same name that is a combination of a black stout beer (like Guinness) and sparking white wine or champagne. The recipe is apparently equals parts of each, either just poured together, or layered in the way of a black-and-tan. 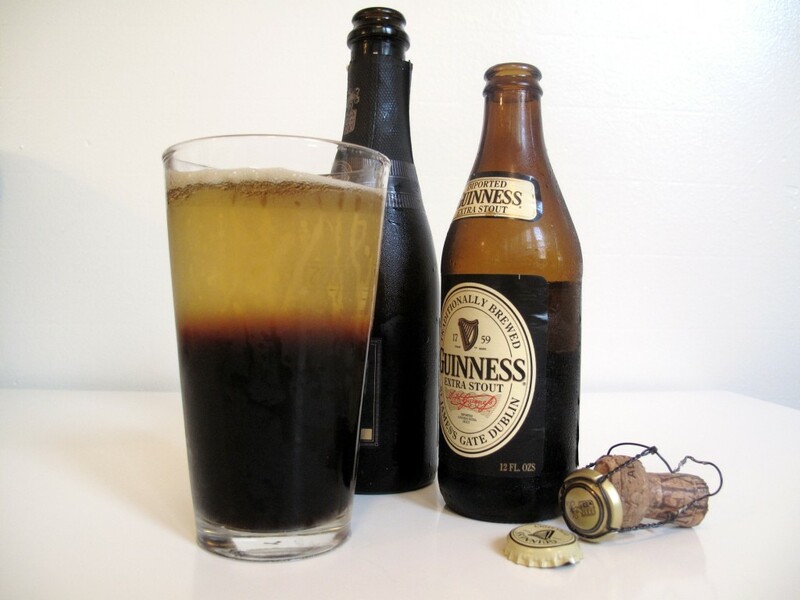 The story of the cocktail is that when Prince Albert died in 1861, the people were in mourning, and that the Steward of Brooks’ club ordered even the champagne to wear black – by mixing it with Guinness! We haven’t actually tackled the Vesper Martini just yet, which is James Bond’s own creation as outlined in Casino Royale. As with most things, Ian Fleming shared Bond’s tastes, he too enjoyed martinis as well as the other drinks in the Bond canon. However on martinis, it appears Fleming preferred a mixture that was a bit simpler than Bond’s exacting formula. The following passage was in Henry A. Zeiger’s Ian Fleming: The Spy Who Came in with the Gold. – A 1966 biography of Fleming. He liked American martinis, as did his hero, but admitted they were somewhat hard to find in London. 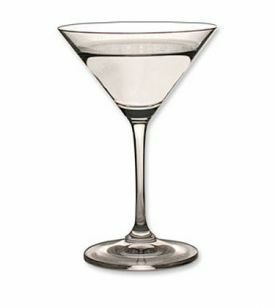 He wrote: “It is extremely difficult to get a good Martini anywhere in England. . . . The way I get one to suit me in any pub is to walk calmly and confidently up to the bar and, speaking very distinctly, ask the man or girl behind it to put plenty of ice in the shaker (they nearly all have a shaker), pour in six gins and one dry vermouth (enunciate ‘dry’ carefully) and shake until I tell them to stop. That’s it. No olives. No lemon peel. No vodka, just gin and vermouth in a 6-1 ratio and shaken. Elsewhere, Fleming states his preference for American vermouth, rather than the continental varieties. Zeiger doesn’t specifically say where Fleming wrote this, though he makes reference to a Spectator article. This passage also appeared in the collection Talk of the Devil a collection of unpublished Fleming material put out by Queen Anne Press. Some purists and mixologists disapprove of the shaking of the martini, insisting the gin will be “bruised.” (Note: that’s nonsense. The possible issue is that shaking could “water down” your martini.) Another, more realistic issue is that your martini will be cloudy after shaking, but even that will clear up after a few minutes. If you’re looking for an easy, simple martini recipe, why not try the Fleming’s original? On the Phantom train with Solitaire in Live and Let Die, they get settled in after boarding. Bond ordered Old Fashioneds, and stipulated ‘Old Grandad’ Bourbon, chicken sandwiches, and decaffeined ‘Sanka’ coffee so that their sleep would not be spoilt. In Thunderball, after a long first day (and before a long night) arriving in the Bahamas and searching for clues, James Bond via room service, orders a “double Bourbon Old Fashioned” before collapsing on his bed. The Old Fashioned is essentially a way to give Bourbon some flavor with bitters (usually Angostura) and some sweetness with sugar and fruit. The roots of the cocktail can be traced back to the early days of the 19th century when drinks of spirits, bitters sugar and water become popular. In time, other ingredients were added to the cocktail, but eventually the original came back into popularity as people began requesting the “Old Fashioned” version. After Felix Leiter surprises James Bond in Manhattan in Diamonds Are Forever, they go to lunch. Bond visits the washroom and when he returns, Leiter has already ordered for him. There was a medium dry Martini with a piece of lemon peel waiting for him. Bond smiled at Leiter’s memory and tasted it. It was excellent, but he didn’t recognize the Vermouth. Cresta Blanca was one of California’s most historic wineries, having been founded in 1882. In 1889, a white wine from Cresta Blanca won the Grand Prize at the Paris Exposition – the first time a California wine won a competition in France. With the victory, the future of the wine industry in the state looked much stronger. They also made a Vermouth, which was what Leiter ordered above. The winery was purchased by Schenley Distillers in 1941, and closed in 1965. The site is now a historical landmark. This is the drink that James Bond orders for Rene Mathis when the latter introduces him to Vesper Lynd in Casino Royale. The most popular way to drink Cognac used to be the “Fine à l’eau” until World War II. Take a measure of Pierre de Segonzac Prestige, pour in 3 measures of pure water and that’s it : contrary to a popular belief, water gives you the chance to appreciate aromas during the first ten minutes. You can also use sparkling water as well. A brandy and soda is a fairly frequently ordered drink in the Bond novels. Later, in From A View To A Kill, Bond is sitting outdoors at a French café pondering his libation options, lamenting that outdoors on pavement is not a place for serious liquor like vodka, whisky or gin. He considers other options, including the fine a l’eau. A fine a l’eau is fairly serious, but it intoxicates without tasting very good. Makes you wonder why he ordered the drink for Mathis if this was his opinion of it. In The Man With The Golden Gun, when James Bond is introduced to the hoods at the Thunderbird Hotel, drinks are being served. The red-coated barman asked him what he would have and he said, ‘Some pink gin. Plenty of bitters. Beefeater’s.’ There was desultory talk about the relative merits of gins. Everyone else seemed to be drinking champagne except Mr Hendriks, who stood away from the group and nursed a Schweppes Bitter Lemon. Pink Gin is a cocktail – one of the foundational beverages of the British Empire. It is, as Bond notes, gin with bitters. Some put the bitters directly into the gin, others put the bitters into the glass, swirl it around, dump them out and add the gin. Meant to be served without ice. 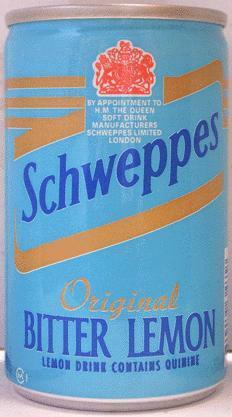 The Schweppes Bitter Lemon being consumed by Hendriks is a non-alcoholic soft drink. It is a flavored tonic water which has never been hugely popular in the United States, but was and is in Europe. The Stinger makes a few appearances in the Fleming novels. This sweet cocktail of crème de menthe mixed with a spirit – usually brandy – is a classic before or after dinner drink. In Diamonds Are Forever, after dinner at ’21’ James Bond and Tiffany case have drinks and coffee. Tiffany ordered a Stinger made with white crème de menthe and Bond ordered the same. Near the end of the book, when the two of them are on the ship headed to England, again they have just finished dinner and are awaiting the rest of the evening. They got into the lift for the Promenade Deck. “And now what, James?” said Tiffany. “I’d like some more coffee, and a Stinger made with white Crème de Menthe, while we listen to the Auction Pool. In Thunderball, when Leiter and Bond go to the casino, they head to the tables only after having “coffee and a stinger at the bar”. White, or clear crème de menthe is critical to a good stinger. Save the green stuff for Largo’s crème de menthe frappe! 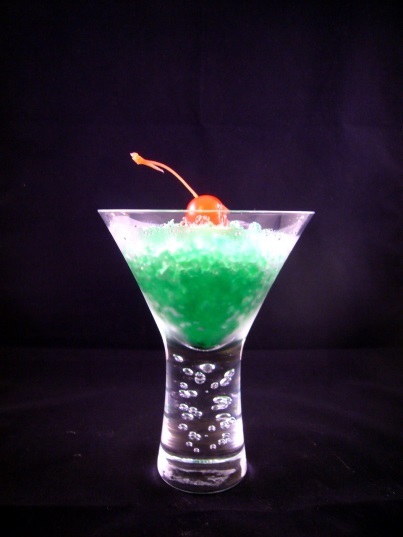 A Crème de Menthe Frappé is simply shaved ice with Green Crème de Menthe poured over the top. In the short story The Hildebrand Rarity, Milton Krest consumes three double bullshots “vodka in iced consomme” before lunch, and then beer with the meal. Bullshots were a drink that became fairly popular in the 1950’s. Sometimes served hot, the drink was usually made from beef broth, and along with the vodka, some people put hot sauce into it as well.